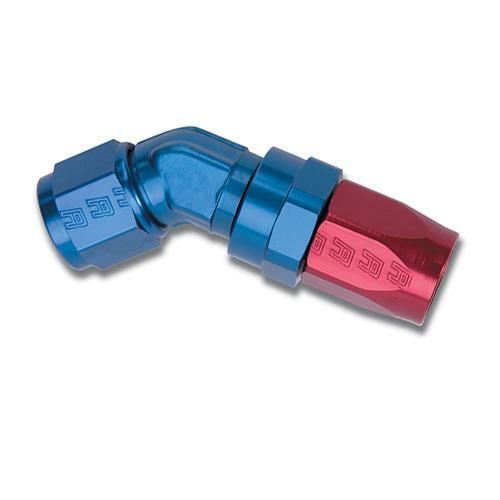 These Russell ProClassic full flow hose ends feature a unique taper design that revolutionizes hose assembly by not cutting into the inner hose liner, yet provides a positive grip on the hose to eliminate leakage or separation. They are manufactured from the highest quality aluminum and are then black and clear anodized to give them a new high performance look. The Russell ProClassic full flow hose ends use a swivel head design, allowing the fitting to rotate as you are tightening or assembling the hose. Choose between straight, 45 degree, or 90 degree configurations that are available in a variety of sizes to fit your specific hose diameter. Upgrade your fittings to these Russell ProClassic full flow hose ends and see the difference.